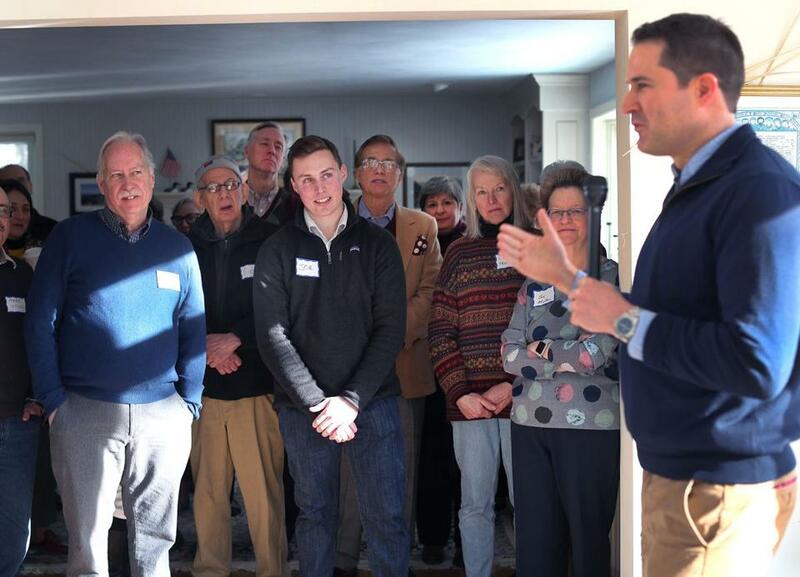 Representative Seth Moulton met with Democrats in Bedford, N.H.
BEDFORD, N.H. — Representative Seth Moulton traveled Saturday across the state’s northern border, where he introduced himself to major Democratic activists in the first-in-the-nation presidential primary state. It was just unclear why he came. With roughly a year to go until the 2020 New Hampshire primary, a number of potential candidates are hiring local staff and crisscrossing the state, like Senator Kirsten Gillibrand of New York was scheduled to do all weekend. But as Moulton, 40, took questions for about 45 minutes from the crowd of 50 in a house on a quiet cul-de-sac, the Salem Democrat never even winked at whether he would be the second person from Massachusetts to seek the presidency, alongside Senator Elizabeth Warren. Holding a microphone, Moulton talked about his life and addressed topics such as climate change, student loan debt, and how to avert nuclear war. It is true that he was invited instead of inviting himself as some potential presidential candidates do. Dave Butler, a 64-year-old retired engineer, helped craft a list of 25 potential presidential candidates the Bedford Democrats should invite to town. Moulton was on their list. With the trip, Moulton could be simply be trying to inject himself back into the national conversation — or at the very least trying to change the conversation when his name comes up. It has been a rough few months politically for Moulton. In the weeks following the November elections, he was vilified for his wildly unsuccessful attempt to deny Democratic leader Nancy Pelosi another shot at becoming US House speaker. Where Moulton argued it was time for generational change away from the 78-year-old Pelosi, many in the party saw it as a white man trying to deny a woman a title she had earned. Moulton faced a fiery crowd at a town hall meeting back in his district and suddenly a serious conversation sprang up about finding someone to mount a primary challenge against him in 2020. By December, Moulton had given up the fight against Pelosi and said he would not run for US Senate in 2020 in a Democratic primary against incumbent Ed Markey as some had speculated might happen. But the news last month that he would even travel to New Hampshire surprised many. While he never ruled out running for president in 2020, he last visited Iowa in September 2017 and his last trip to New Hampshire was in July. Unlike many introducing themselves in New Hampshire, Moulton was met with some familiarity but also some skepticism. Not only is he infamous now for his opposition to Pelosi, who remains popular among local Democratic activists, he faces flat-out hostility among a small but vocal group of the Democratic establishment for his very active role in recruiting and supporting an unsuccessful candidate for Congress, Maura Sullivan, who had moved to the state only three months before filing her candidacy. It is unclear if or when Moulton will travel to another early primary state again.